Several years after the near-collapse of human civilization, the evolved chimpanzee Caesar (Andy Serkis) defends his community of apes from the human army that is hunting them down. When his wife and son are murdered by a human Colonel (Woody Harrelson), Caesar sends his people towards a new safer home before hunting down the Colonel by himself. 2011’s Rise of the Planet of the Apes was an unexpected near-masterpiece, combining a smart and inventive story with cutting-edge computer-generated characters to reboot and relaunch the Planet of the Apes franchise. Its 2014 sequel Dawn of the Planet of the Apes felt a huge disappointment by comparison, with a leaden storyline, bland human characters and an egregious waste of on-screen talent – notably Gary Oldman as the film’s primary antagonist. Thankfully the third film in this re-invigorated franchise, last year’s War for the Planet of the Apes, is a truly spectacular return to form. Not only does it equal the quality of the first film, it actively draws on elements of the second to improve it and make it feel relevant in retrospect. 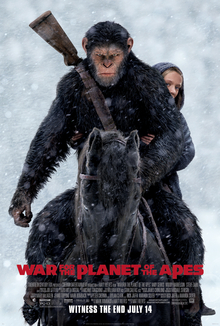 What is remarkable about War for the Planet of the Apes is that it uses the post-apocalyptic setting and human-versus-ape set-up to essentially tell a western. The outlaw gang rides into town, the reluctant gunman’s wife and child are killed, and he rides out with a small posse of friends to take his revenge. It is a smart play, giving the film a personal focus and a hardened edge that the previous film lacked. Andy Serkis is superb as Caesar. Now older and visibly wearier after so much time protecting his people from human assaults, he brings so much depth and subtlety to the role – factors which have been picked up and accentuated by the visual effects team who constructed the digital Caesar on top of his performance. Also hugely impressive is Karin Konoval as Maurice, Caesar’s orangutan adviser and oldest friend. Maurice has been an appealing factor in all three Apes films, but the material they give the character here seems particularly strong. On the other side, Woody Harrelson plays the anonymous Colonel with tremendous vigour, pushing the character to the top without ever completely breaking over it. Less successful is Steven Zahn’s curious character “Bad Ape”, who feels oddly out of place like a character inserted for a third act reveal that never quite gets around to revealing himself. The performance is a little too cartoonish and the character edging towards “Jar-Jar Binks” territory; the film would be better off without him. The film is littered with references to the original Planet of the Apes films of the 1960s and early 1970s. Some of them are blatant, while others are more oblique, but collectively they point with fondness to the franchise’s legacy. Now that we have reached the closure of a narrative trilogy, it is easier to see the manner in which old elements were not just referenced but actively remixed. It has also effectively pointed itself towards the 1968 original film, if viewers wish to take it that way. We’re clearly thousands of years from that story, but you can now see it shimmering on the horizon. It also plays heavily with references to real-life conflicts. An early scene reflects the Vietnam War. Later sequences bring to mind the Israel/Palestine conflict. The film does not take on a positive attitude towards humanity, pointing repeatedly towards our civilization’s ability to not only fight others but also to self-destruct. It also includes the fascinating story element of ape collaborators: leftovers from Koba’s attempted revolution in Dawn of the Planet of the Apes that have elected to aid the human soldiers rather than beg forgiveness from Caesar. It’s worth questioning the rather arbitary naming of this film trilogy, in which the second film (Dawn) has a title more fitting of the first film, the third (War) a title more fitting of the second, and the first (Rise) one that would have applied better to the third. It’s a curious quirk that’s only real effect is to upset expectations: anyone expecting a fully-fledged war in this third movie is going to be disappointed. The action is strong, the narrative has a powerful drive to it, and while events feel a little drawn out and tonally muddled in the end, it all wraps up in a satisfying fashion. This iteration of Planet of the Apes could easily end here, but there are dozens of potential directions in which it could go from here. War for the Planet of the Apes pulls its trilogy back into shape and then some. This is strong, populist filmmaking.